Tile comes in many different styles, but choosing the right one for your remodeling project doesn’t have to be difficult. With a basic understanding of tile types, finishes and grout color options, as well as some idea of what room the tile will be installed in and what your design preference is, you’ll be able to narrow down your choices considerably. When it comes to tile, the two most common types are ceramic and porcelain. Though they have different names, they are essentially the same, with just a few minor differences. Both are part of the ceramic category of tile, and each has certain qualities that make it either porcelain or a non-porcelain. Traditional, non-porcelain ceramic tiles are suitable for light to moderate traffic. A chipped ceramic tile will show a different color underneath the surface, but while they wear a bit more easily than porcelain tiles, they do have a slightly higher water absorption rating. And traditional ceramic tiles tend to cost less. 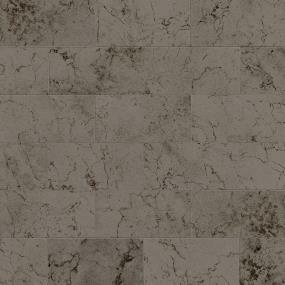 Porcelain tile is one of the densest, most durable tiles on the market. Made to withstand high temperatures, porcelain tiles won’t stain, scratch, burn or chip easily. This is an ideal tile for your laundry room or mudroom where you want a casual look but need flooring that will be strong and impervious to moisture. Porcelain and ceramic tiles are given a PEI (Porcelain Enamel Institute) rating on a scale of 1 to 5, with 5 being the hardest, densest (and most durable) tile. For example, a rating of 2 would mean a tile could handle very light foot traffic (suitable for bathrooms), while a rating of 5 would mean a tile is suitable for very heavy commercial foot traffic. PEI ratings for porcelain tend to be around a 5, while those for ceramic range anywhere from a 1 to 5, with most falling somewhere along the lower end of the scale. In addition to the many choices you have in porcelain and non-porcelain tile, there are also many options in natural stone tiles that offer both subtle and significant differences, from appearance to durability, based on the type of stone. The natural stones most commonly used in tile are granite, slate, marble and travertine. Granite is a dense-grained hard stone. It's actually the second hardest known substance next to diamonds. Granite combines strength and durability with rich patterns and veining. Because of its durability, granite can be used on kitchen countertops, wet bars, entry walls, floors, fireplaces and bathroom vanities. Slate is best suited for floors, walkways and roofing, and recently has been used attractively for kitchen countertops and wet bars. It's a dense, very tough composite that's typically available in blacks, grays and greens, although many other colors can also be found in slate products. Slate shades within the same color family often vary. Veined patterns from overseas have also recently been introduced. Marble is one of the more popular natural stones. It is generally softer than granite and has more porosity, which makes it a better choice for bathrooms, tub decks and courtyards than granite. Marble isn’t recommended for kitchens, though, unless the stone is honed and sealed. Travertine is a less dense form of marble that is highly porous best used in entry walls, floors, fireplace surrounds, vanities, shower walls, tub decks and mosaics. It’s not recommended for kitchen or wet bar countertops because it can be easily scratched and stained. Beyond choosing the type of tile you want, there is the finish and grout color to consider. The three most common types of tile finishes are natural, honed or polished. Natural surfaces have an earthy, dull appearance. The unfinished characteristics of natural surfaces include texture and pitting. Honed surfaces have a smooth, matte appearance that is achieved by terminating the finish process prior to buffing. This type of surface is ideal for high-traffic and wet areas to prevent slipping and wear. Polished surfaces have a highly reflective, mirror-like finish. The process creates an almost impervious, but also more slippery surface. The color of your grout will help you achieve a distinctive look for your home. Depending on your individual design preference, you can choose grout that coordinates with, contrasts or even accents your tile. A coordinating color will give you a more uniform look that requires less maintenance. It will complement the natural beauty of your tile without distracting from it. A tile floor that blends with its grout color is a great neutral option, while a contrasting grout color can provide a unique look. Play with different color combinations by choosing a grout color that picks up on the darker veining that runs through your tile or pick up a secondary color from your room’s design palette. Once you have an idea of which tile is right for you, and you’ve saved images you like to the myProSource project center, visit your local ProSource Wholesale® showroom to view samples. Or if you’re still undecided, stop in for some design inspiration. Either way, our dedicated showroom staff can introduce you to a trade professional who can help you choose the perfect tile and make it come to life in your home.